With Fusioo you can improve client relationships through transparency. Fusioo will help you build transparent client relationships through information sharing. Invite your clients on board and reap the benefits of self service and trust. Lite Users. Clients are normally invited on board as Lite Users. 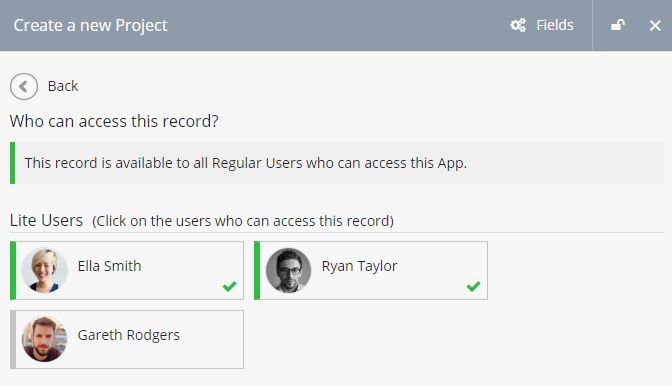 Such users can be on boarded for free and will have limited (view records and take part in project discussions) access to your Fusioo workspace. You will get to control which records are shared. The same permission settings apply for both Regular and Lite Users. You control which Apps, Dashboards and Fields are visible to your clients. Shared Dashboards will be populated with data you specifically share with your clients.